When this 1000-car, single screen drive-in first opened in August of 1964 admission was just $1.00 and a cheeseburger was $0.45. Today, the Capri still boasts a taste-tempting concession stand and guests can watch new-release movies from their cars or spread blankets on the grass lawns. However, the cumbersome audio speakers of yesteryear have been replaced with 21stcentury radio sound--movie-goers tune to a specific frequency to hear the movie. 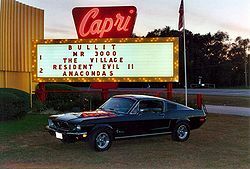 In the summer of 2001, The Capri Drive-In earned its highest honors, named One of Ten Drive-ins Worth a Detour by both the USA Today and The New York Times. Drive-in author and aficionado Don Sanders wrote "The original family runs the theater, which has great food and the original neon sign. Great FM sound system, too. 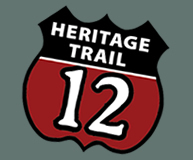 This family (Tom and Sue Magocs) really knows what a drive-in experience should be." The 50s, 60s and 70s were boom times for drive-ins. In 1954 there were 87 open drive-ins in Michigan, growing to a peak of 110 in 1958.